Laundry used to stress me out. Since it stressed me out, I would avoid doing laundry for as long as possible. I would let the piles grow & grow until we were all out of clothes. Then I’d finally have to tackle this now daunting task. It was nearly impossible to get things under control, & it was something that weighed on me day in & day out. Our family didn’t have much of a system when it came to laundry. Everyone would throw all of the dirty laundry into one big pile. I would wash it all, & then I would have to sort it all out by person before putting it away. I didn’t separate colors or anything like that – I just threw arm fulls of clothes into various piles around the house. One day, I was sitting in the middle of a huge pile of laundry simply sorting clothes. I wasn’t folding them or putting them away. I was just separating the clothes and creating smaller piles for each person in the family. It dawned on me that I could easily eliminate this step in the laundry process. I could save time & sanity with a simple change in our laundry routine. I wouldn’t have to sort out each family member’s clothes if I never mixed them to begin with! I never sorted laundry by colors anyway so why not do loads of laundry sorted by person? Each person has their own laundry basket, & then I have one for bathroom towels & wash cloths & one for kitchen towels & rags. When a basket fills up, I wash it! No need for crazy, overwhelming laundry days where I feel like I need to wash several loads in a row. When that person’s laundry is clean, it goes back to their room. Sometimes it’ll sit there unfolded, but at least I know that all of the clothes in it are clean & belong to that person. When I have a small chunk of time to put away laundry, I can tackle one person’s laundry without feeling like I have to stop mid-task. I always know where a certain item of clothing is. If my son is missing a particular shirt, I know that it is in his laundry pile. (Then I can also quickly know whether it’s clean or dirty). It is easy for everyone to put their own clothes in their own baskets. When my husband needs a certain outfit for work, he can do his stack of laundry without having to dig through everyone else’s. 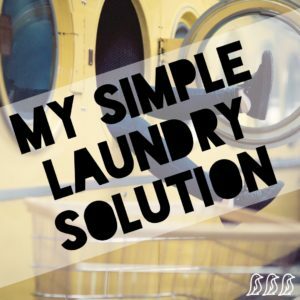 I have been doing laundry this way for a few years now, & the system still works so well for me! It just feels so much more manageable for me.